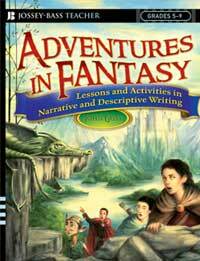 Adventures in Fantasy offers an exciting approach to teaching narrative and descriptive writing that stimulates a student's creativity and imagination. Filled with mini-lessons, reading projects, and hands-on writing activities, the book shows teachers step-by-step how to introduce students to the "magic" of creating a complete story in the fantasy/adventure genre. Before fleshing out their stories, however, students are asked to construct actual maps of their 'fantasyland' – and then to write a travelogue describing the setting in vivid detail. This initial fantasizing encourages students to be wildly inventive in creating the drama, ogres, villains, heroes and heroines featured in their story, and on the way they learn about the mythic journey. Adventures in Fantasy offers teachers a creative method for teaching conventions such as voice, theme, point of view, and attention to the reader. The approach has proven to work well with both advanced and struggling students and is easily integrated with other writing curricula. A clever idea told with great imagination and vivid detail - just like every good fantasy novel, incidentally. This is an excellent source for soon-to-be-popular teachers, but just between you and me, I can think of a few fantasy authors who would benefit too. Teachers, students, writers, prepare yourselves! John Gust's Adventures in Fantasy will propel you into a world like no other: your imagination and the wonderful power that lies within it. This mage of fantasy, constructivist teaching, and creative writing leads you on a heroic journey that surpasses the noble quest to be stronger, more confident fantasy writers. Follow step-by-step, or pick and choose from Gust's exhaustive strategies for teaching setting, characterization, plot, dialogue, figurative language, and mechanics. A treasury of information and imagination for middle-grade writing teachers whose goal is to provide students with a means to discover the joy and accomplishment of good story writing. Gust describes how he engages his students in order for them to achieve the creation of their own highly skilled adventurous, fantasy writing journey. Humorous, thoughtful, engaging and practical, Gust provides hope that our children can experience this same educational transformation on the road to becoming real writers. More than mere strategies and activities, he has drawn the secret map and all we need to do is follow.